If you're a bartender looking for work, you can expect to attend a job interview before you get hired. What's the best way to make a good impression on your interviewer? Essentially, he or she will be looking for someone who has great people skills and can make good decisions while on the job. Ace your job interview by preparing answers to the typical interview questions you’ll be asked. Getting ready for your job interview ahead of time will make you seem more calm, poised, and confident when you meet your potential employer. It’ll also give you the edge over the competition. Read on to learn more about specific topics that your interviewer will want to know about. Being a bartender requires discernment. In fact, your judgment can potentially save lives when dealing with customers who have been drinking heavily. 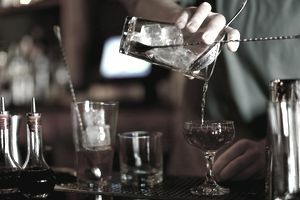 As a result, potential employers often ask bartenders whether they're capable of assessing if someone has had too much to drink. No bar or restaurant wants to be on the hook for patrons who leave their establishment and drink and drive, or who do do something equally as dangerous because they’re intoxicated. It’s important for a bartender to know when to stop serving inebriated customers, and also how to deal with the fallout if the customers get angry. Bartenders must also handle conflict, such as customers who've had too much to drink and behave rudely or obscenely as a result. There's not necessarily one right answer to these sorts of interview questions, but your prospective employer would like to know if you have a plan for these all too common scenarios. Prepare to describe your experience in handling these types of situations. Working as a bartender may be tough not only because of rowdy customers but also because of the sheer stress of handling multiple orders in a crowded and loud environment. Accordingly, employers will want you to describe the most stressful work environment you have experienced. How did you handle the situation? Moreover, if the bar is extremely crowded and busy, how would you decide in which order you tend to customers? Employers will also want to know if you can do more than serving drinks. For example, do you have any experience serving food? Would you be comfortable taking food orders at the bar? Bartenders need to have good memories, so expect to be asked about yours. How strong is your memory? Have you ever had to memorize a long list of items before? How do you handle taking a large order? Being a bartender often requires teamwork. Given this, the job interviewer might want to you to describe a time in which you had to work with your coworkers to solve a problem. How did working with others help solve the problem? Effective bartenders have a number of skills, including how to manage employees. In addition to your experience as a bartender, your interviewer will want to know if you’ve ever worked with or trained a barback. Or how would you feel about training one? A good bartender may also need to be a good salesperson and will often need to make drink recommendations to customers who don't know what they should drink that night, especially if the bar is out of their normal go-to range. So your interviewer might ask you to describe your skills as a salesperson. How do you handle customers who aren’t sure what they want to eat or drink? Your interviewer will also want to know about your previous experiences in bars. For instance, what types of bars do you enjoy frequenting on weekends? Do you like to spend time in large or small groups of friends when you go out to bars? Tell me about your bartending training and experience. What's your favorite drink to make? What's your least favorite? Do you have alcohol awareness training or certification? Do you have any experience serving food? Would you be comfortable taking food orders at the bar? How would you describe your skills as a salesperson? How do you assess whether or not someone has had too much to drink? How strong is your memory? Have you ever had to memorize a long list of items before? How would you handle a customer who has had too much to drink and is being rude or obnoxious? Describe a stressful work environment you have experienced. How did you handle the situation? Describe a time in which you had to work with your coworkers to solve a problem. How did working with others help solve the problem? If the bar is extremely crowded and busy, how would you decide in which order you tend to customers? Have you ever worked with or trained a barback? How would you feel training about training a barback? What type of bars do you enjoy frequenting when you go out on weekends? Do you like to spend time in large or small groups of friends? Don't prepare for your job interview by only prepping answers to job-specific interview questions as described above. That's because you’ll also be asked more general questions about your employment history, education, strengths, weaknesses, achievements, goals, and plans. Given this, it makes sense to review the most common interview questions and prepare answers for each question in a way that shines a bright light on your past experience and your skillset.